The front of the box indicates that this cereal provides "over 2/3 of your day's whole grain" and that it's "made with natural wildflower honey." 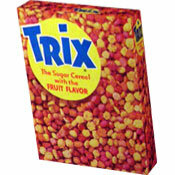 "4 grams fiber: Fiber fills you up, helps keep you satisfied and is important to help maintain digestive health. "Rich in nutrients: Honey Bunches of Oats Whole Grain Cereal is rich in nutrients such as iron and folic acid - important for moms-to-be and growing children. "Over 2/3 of your day's whole grain: Whole grains are an important part of a balanced diet, but on average, Americans eat less than 1 serving of whole grains per day. "Starting your day with a bowl of Honey Bunches of Oats Whole Grain Cereal is a smart step toward eating a balanced diet." The first 10 ingredients listed on the side panel are whole grain wheat, rice, sugar, whole grain rolled oats, brown sugar, canola oil, corn syrup, wheat flour, corn meal and malted barley flour. 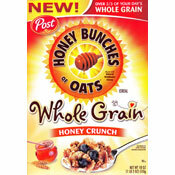 Honey Bunches of Oats Whole Grain: Honey Crunch Cereal has been reviewed on MrBreakfast.com. 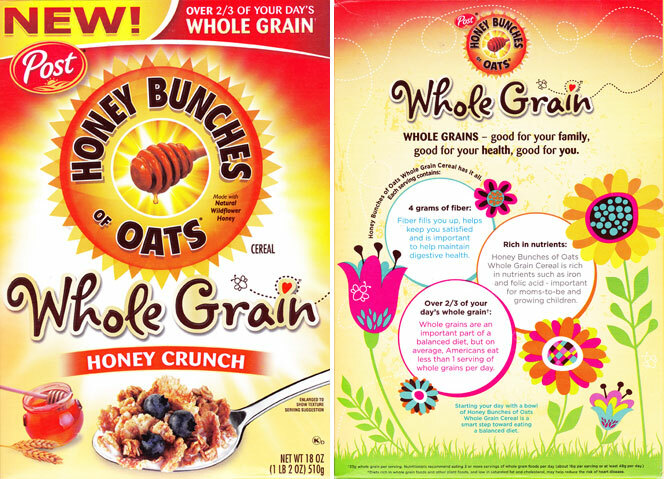 What do you think of Honey Bunches of Oats Whole Grain: Honey Crunch?